one of the most vital places in the heart of New York City. who have made Madison Square what it is today. artist — Stanford White and Augustus Saint-Gaudens. 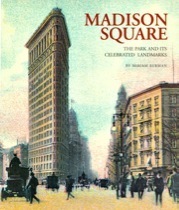 Madison Square has managed continually to reinvent itself — Madison Square: The Park and Its Celebrated Landmarks captures with great detail the then and now of this timeless place. 8 1/2 x 10 inches. 144 pages. Vintage photographs, 120 color and 50 black and white.